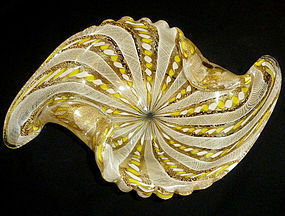 Gorgeous Murano Hand Blown GOLD FLECKS Art Glass LEAF Shape Bowls!!! Created by ARCHIMEDE SEGUSO!!! 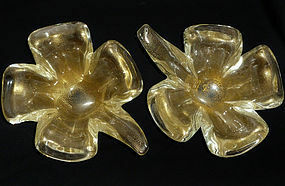 These would be great ring, jewelry or candy bowls. Made with thick and heavy glass. They have NO damage (chips, nicks, fleabites or impact marks). In EXCELLENT Condition!!! They measure 8" long (20.32 cm) x 6 1/2" wide (16.51 cm) x 3" tall (7.62 cm) .… International Buyers WELCOMED!!! ........ Questions? Don’t hesitate to ask! 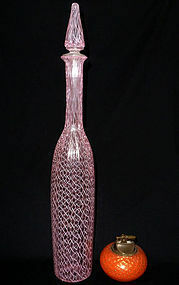 RARE Large Murano Hand Blown PINK Art Glass SATIN Vase with Original Label!!! Documented as an ERMANNO TOSO piece, for FRATELLI TOSO in the "A PENTONI" design. The soft pink cut canes look like flower petals. It has NO damage (chips, nicks, or fleabites). In EXCELLENT Condition!!! 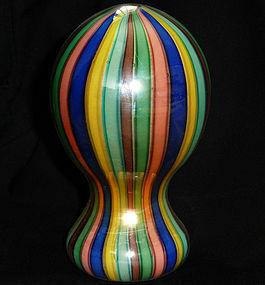 Measures 13" high (33.02 cm) x 4 1/4" wide (10.79 cm) … International Buyers WELCOMED!!! ........ Questions? Don’t hesitate to ask! 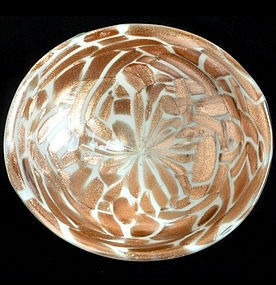 Large Murano Cased White and GOLD FLECKS Art Glass Space Age Bowl!!! Attributed to the SALVIATI company!!! The piece has a submerged white layer covered in clear glass.It has NO damage (chips, nicks, or fleabites). In EXCELLENT Condition!!! Measures 10 1/4" across each side (26.03 cm) x 2 3/4" high (6.98 cm) … International Buyers WELCOMED!!! ........ Questions? Don’t hesitate to ask! 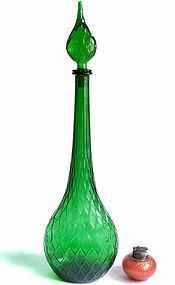 Huge and Gorgeous GREEN Jewel Tone and DIAMOND QUILTED Architectural Italian Art Glass Floor Decanter!!! Attributed to the GUILDCRAFT Company. There is NO damage (chips, nicks, or fleabites). In EXCELLENT Condition!! 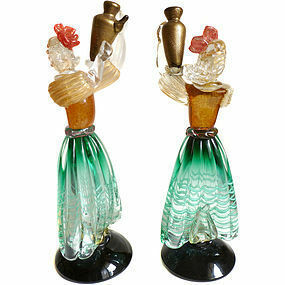 Measures 26" tall x 7 1/2" long x 5 1/2" wide … International Buyers WELCOMED!!! ........ Questions? Don’t hesitate to ask! 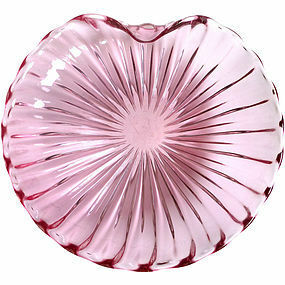 Beautiful Murano Sommerso PINK Art Glass Ribbed Centerpiece Bowl! Documented to ALFREDO BARBINI, circa 1950-60s, and published in his catalog! It has 1 fold on the rim which can act as a handle. Has no damage (chips, nicks, fleabites). In EXCELLENT Condition! Measures 11 1/4" long (28.57) x 10 1/2" wide (26.67 cm) x 3" at highest point (7.62 cm) … International Buyers WELCOMED!!! ........ Questions? Don’t hesitate to ask! 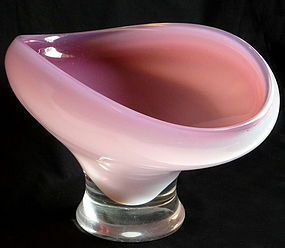 Amazing Murano Hand Blown PINK and WHITE OPALESCENT Art Glass Compote Bowl!!! Attributed to the CENEDESE Company!!! 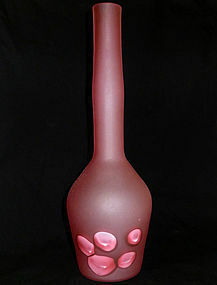 The piece has a beautiful pink color and sensual shape. It is also very large and heavy. 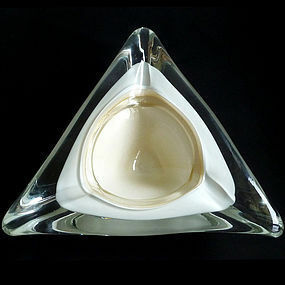 Would make a perfect fruit bowl or fill it with flowers for a special occasion. There is NO damage (chips, nicks, or impact marks). In EXCELLENT Condition!!! 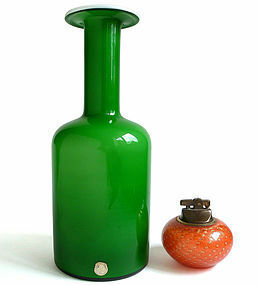 Bright and Colorful DANISH MODERN Cased GREEN over WHITE Art Glass Gulvase Vase!!! Designed by Otto Brauer for Kastrup Holmegaard, Denmmark, circa 1960s!!! The piece still retains a worn label near the bottom. It has NO damage (chips, nicks, or fleabites). In EXCELLENT Condition!!! 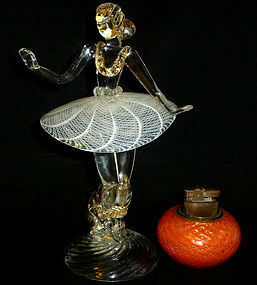 Measures 12" tall (30.48 cm) x 5" wide (12.7 cm) ... International Buyers WELCOMED!!! Questions? ........ Don’t hesitate to ask! 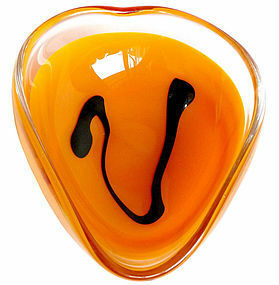 Beautiful Cased ORANGE SCANDINAVIAN Bowl, with V Design in BLACK, signed FLYGSFORS 63 or 60 - COQUILLE underneath and designed by PAUL KEDELV!!! Rare color, usually only seen in Black and White. For accuracy, there is a very tiny impact mark to the rim (photo 5). Has NO other damage (chips, nicks, or fleabites). In GREAT Condition!!! 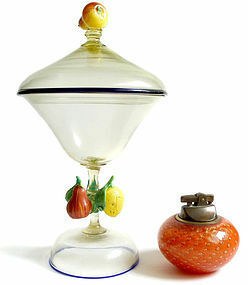 Venetian, Antique, Early Murano Hand Blown Art Glass Compote or Covered Jar with Applied FRUIT Decoration!!! Attributed to FRATELLI TOSO, circa 1900s!!! The piece is lined with Cobalt Blue trim, and has 4 applied fruits, including 3 Pears and a Lemon. Has NO damage (chips, nicks, impact marks or fleabites). In EXCELLENT Condition!! !